With Puerto Rico still struggling to recover from the ravages of Hurricane Maria, the Federal Emergency Management Agency is under pressure to release documents to explain a since-canceled $156 million contract with a one-person company to provide 30 million meals for the island. Democrats on the House Oversight and Government Reform Committee tell Government Executive they have had no response from Chairman Trey Gowdy, R-S.C., to their Feb. 6 request for a subpoena to obtain materials on why the agency hired the one-woman, minority-owned firm Tribute Contacting LLP. The contract with Tiffany Brown, an Atlanta-based entrepreneur who owns a women’s clothing line, an entertainment company, a media service and a beverage delivery software app, was canceled after 20 days when FEMA had received only 50,000 pre-prepared meals. The lawmakers list an array of previous federal contracts with Tribute that were canceled over the past five years, including food contracts with the Federal Prison System and tote bags for the Government Publishing Office, an agency that temporarily barred Tribute from new contracts. According to recent news reports, the contract was terminated both because her deliveries were late and because the meals came in two separate packages that had to be combined before reheating. Brown told congressional staff she won the award “because I was able to submit a proposal to supply 30 million meals at the cheapest cost.” Using subcontractors, she worked “24 hours a day, 7 days a week to try and provide these emergency meals.” Her two subcontractors stopped supplying materials when they did not get promptly paid. In comments this week to The New York Times, Brown described her work as that of “almost like a broker,” who does not keep employees or specialize in any field but is able to procure subcontracted work as needed. She is appealing the termination and seeking a settlement of $70 million. She said she has 75,000 undelivered meals sitting in a warehouse. FEMA has been under pressure to release its internal decision-making documents since the story came to light in October, when FEMA officials reported major shortages of meals on the island. 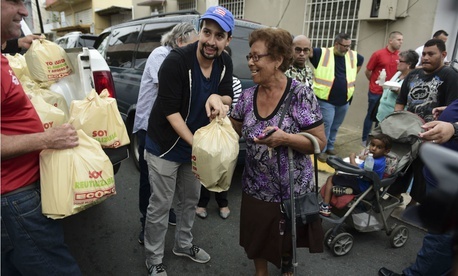 FEMA has continued to provide meals and water to Puerto Rico as requested. Throughout the course of the response activities FEMA, working closely with the government of Puerto Rico, continually assessed and evaluated the need for sourcing additional commodities. As recovery commenced, and needs for federal resources diminished, FEMA made similar reductions in its sourcing. According to the Homeland Security Department website, FEMA approved more than $1 billion in grants to survivors of Hurricanes Irma and María. More than 1.1 million Puerto Rico residents have registered for FEMA assistance, it said, and the agency has provided $1.6 billion in food and $361 million in water. In a Thursday commentary, the nonprofit Project on Government Oversight highlighted broader procurement deficiencies at Homeland Security-based agencies, based on January inspector general’s report on the department’s insufficient record of suspending and debarring flawed contractors. Finally, during an eight-month period (August 2016 through March 2017, before last summer’s hurricanes), FEMA did not promptly update governmentwide systems to reflect debarments and administrative agreements, a situation since corrected. DHS agreed with the report’s recommendations. And in December, Rep. Bennie Thompson, D-Miss., ranking member on the Homeland Security panel, wrote a letter to then-Acting Homeland Security Secretary Elaine Duke questioning a FEMA Request for Information offering a $100 million sole-source award for resource capability and transportation support. Thompson had been calling for improvements in oversight of FEMA’s procurement practices since at least 2011. On Thursday, Thompson sent a letter similar to Cummings’ to Homeland Security Secretary Kirstjen Nielsen.